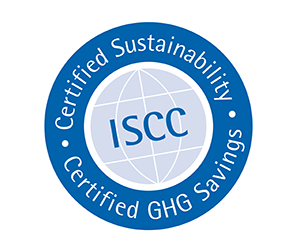 17.07.18 | ISCC Technical Stakeholder Committee Meeting "Waste, Residues and Advanced Low Carbon Fuels"
Independent smallholders from Jambi have received their first ISCC certificate. 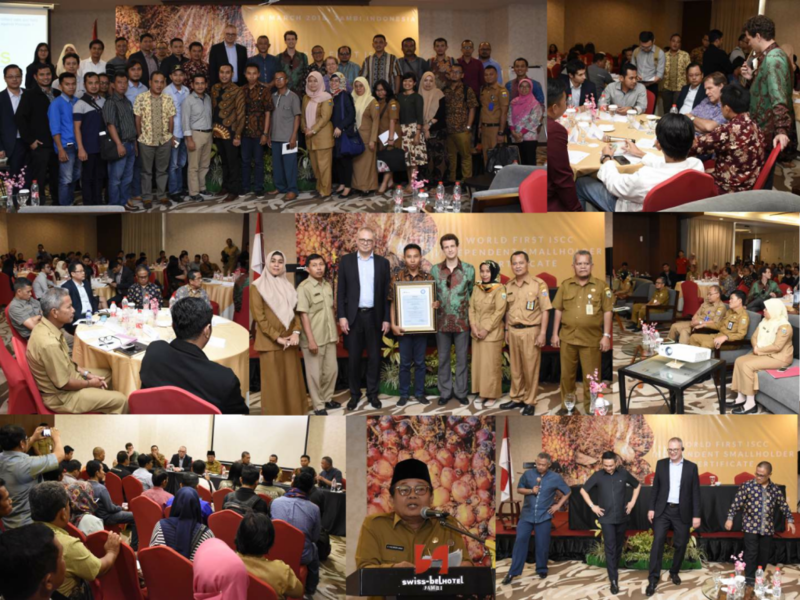 This was celebrated on 26 March at Swiss Belhotel in Jambi City with around 100 participants, project partners such as SNV, Government and company representatives. 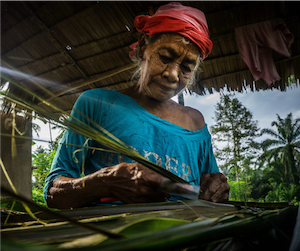 The certificate is based on an innovative smallholder approach, which was developed as part of the Berbak Green Prosperity project co-funded by MCA Indonesia and supported by Mott MacDonald. The event was moderated by Dr. Erwin Widodo, who is also a representative of Tropical Forest Alliance (TFA) in Southeast Asia. A press conference was also organized during that day, so that questions from the press have been answered officially. The event was attended by Vice Governor of Jambi, Dr. H. Fachrory Umar and Poprianto Bustami, Head of 4th Commission, Lower Parliament and Heads of Agencies of Districts of Muaro Jambi. The welcome address was given by Imron Rosadi, Head of Investment Agency followed by the opening speech from the Vice Governor. The ISCC Certificate issued by the certification body Mutuagung Lestari was handed over by the Vice Governor to Sufyan, Group Certification Manager of KUD Makarti. Hans Smit, Head of SNV Global Palm Program and Dani Rahadian Hidayat, Palm Oil Advisor, SNV provided details of the project and how to make smallholders certification ready. Andreas Feige, Managing Director of ISCC explained the Independent Smallholder Certification concept enabling smallholder farmers to access the international market for fully traceable and deforestation free palm oil at a competitive price, taking away the need to further expand into forested areas. Sufyan of KUD Makarti shared his experience during the project and provided feedback on challenges and benefits from the farmers end. He was followed by Martinus Nata, Director, Prosympac who explained the role of the mill and gave an outlook on the mills plan in how to integrate thousands of smallholders in the near future. Bernard Alexander Riedo, Director, Asian Agri and Dr. Haskalianus Pasang, Head of Sustainability Policy and Compliance, Sinarmas gave insights in their company goals and their plans in how to extend their smallholder supply base. Last but not least Andreas Feige presented a smallholder mobile APP and the GRAS database and risk management tool which enables smallholders to receive an automated response whether their fields are eligible for certification especially regarding highly biodiverse and carbon rich areas and deforestation. Finally the participants broke out into group discussions on ISCC and ISPO certification, access to micro finance, Jambi investments and smallholder capacity building, moderated by Dr. Erwin Widodo. He also announced in his capacity as TFA representative that ISCC is in the process of becoming a TFA member. ISCC is thankful to all the parties, who support the smallholders becoming certified and participating in the organization of the event and we strongly believe that this is just the first step of a very successful path for the independent smallholders in Indonesia. 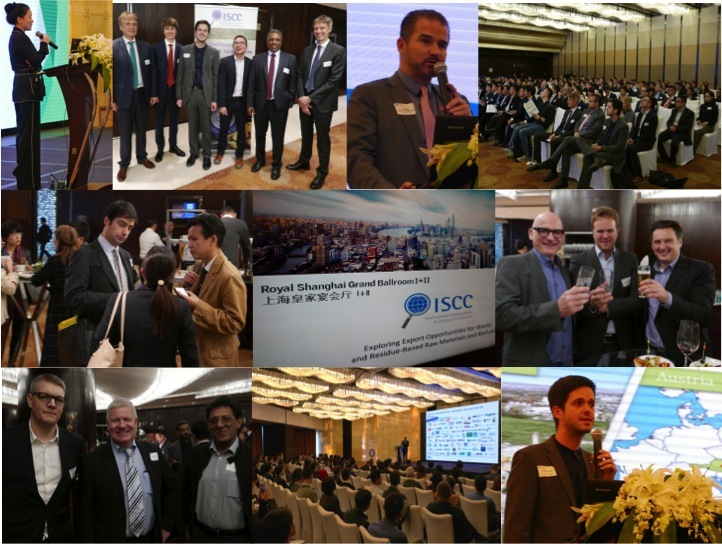 06.03.18 | ISCC Conference "Promoting Sustainability in Agricultural Supply Chains"
On November 13 ISCC hosted a conference in China with a particular focus on the certification of waste/residues based supply chains for renewable energy. The conference was a huge success, with more than 260 participants attending. The conference covered the regulatory framework and market developments for waste/residue feedstocks and biofuels in Europe and the USA, the supply of waste and residue feedstock from China and other countries in the region, as well as ISCC certification for secure global supply chains. Thuy Tien Phan, CONG S TAO Ltd.
Justin Yuan, STIN (China) Business Service Co. Ltd.
Louis Tseng, Chant Oil Co. Ltd.
During this event innovative and cost-effective solutions for reducing methane emissions from POME ponds were presented and discussed with high-level speakers as Diah Suradireja, Vice-Chair of the ISPO Strengthening Committee and Adrian Suharto, Head Stakeholder Engagement, Neste, and more. 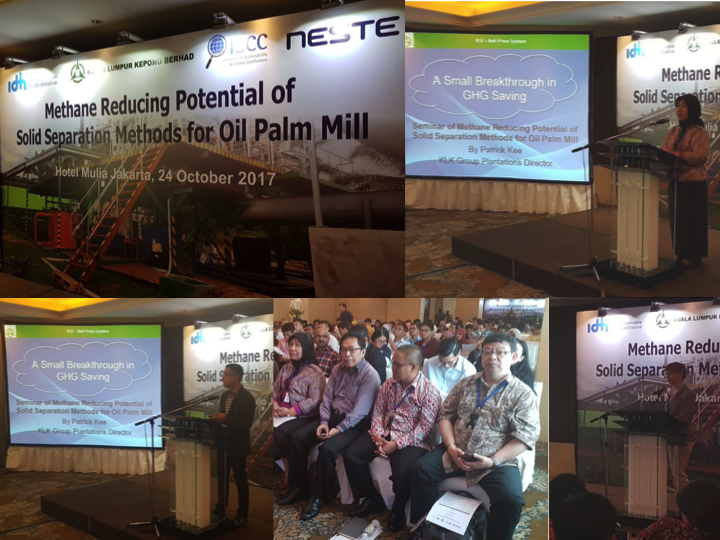 Last year, KLK (Kuala Lumpur Kepong Berhad), Neste, ISCC (International Sustainability and Carbon Certification) and IDH (The Netherlands Sustainable Trade Initiative) have agreed together to research a method – potentially reducing GHG emissions – which is used by KLK plantations to generate solids useable for organic fertilizer. 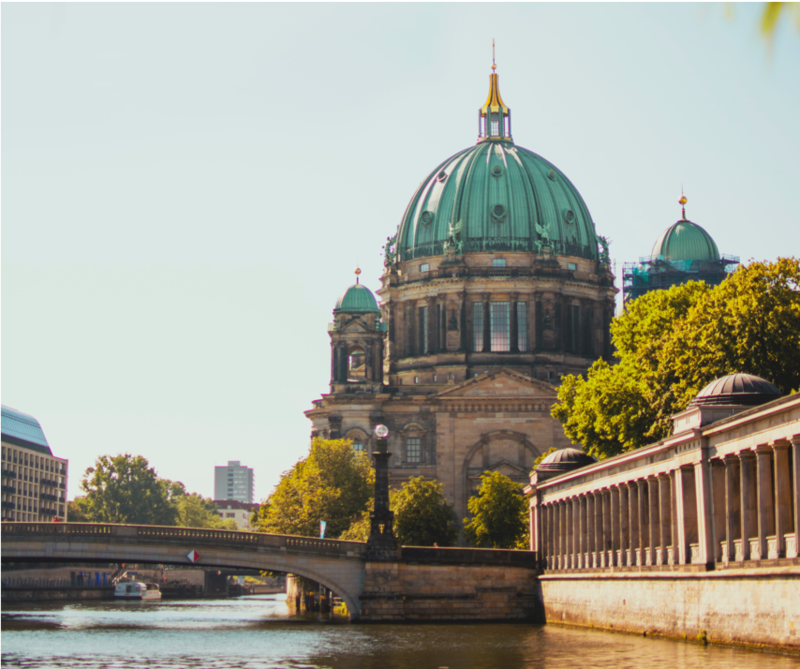 All the parties believed that the solid separation method would need to be researched further to understand its potential in GHG reduction and eligibility under the EU-RED regulation. 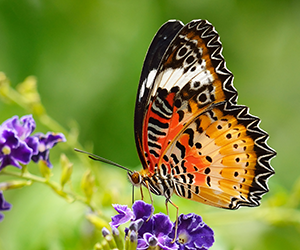 After nine months of field measurement, analysis and calculation, all the parties involved have shown the preliminary results of the research. The goal of this event is to promote the implementation of this and similar technologies in the industry and thus contributing to reduce the overall GHG emissions. 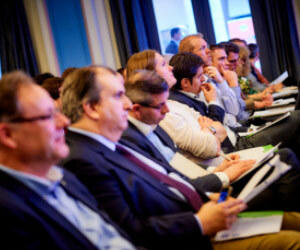 ISCC, in cooperation with PRIMA, has organized a high level conference, discussing upcoming developments in the low carbon fuels markets with a focus on the West Coast. 09.03.17 | ISCC Information Event "Sustainable Biomass and Bioenergy"
ISCC, in collaboration with GLOBALFORUM, hosted the international seminar “Sustainable Biomass and Bioenergy” in Ecuador. Speakers from the local palm and sugar industries as well as authorities discussed opportunities and challenges with regard to sustainability and sustainability certification. ISCC as solution provider for sustainable and deforestation free supply chain has been presented, and practical experience with ISCC certification in the region were heard. 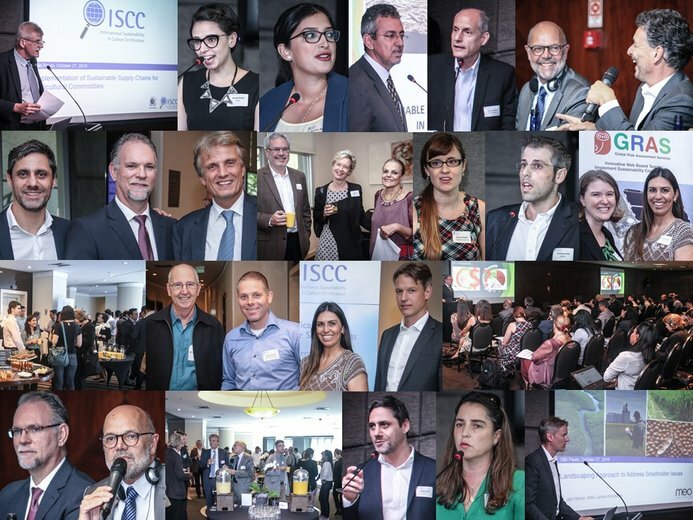 ISCC hosted a one-day conference on sustainable and deforestation free supply chains in São Paulo on 27 October 2016. 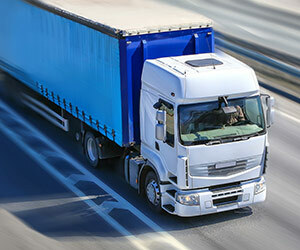 High-level representatives from the industry, leading research institutions and national authorities have discussed the latest trends and developments in the implementation in the sustainable supply chains in Latin America.